America's Finest 360 Just Went Over 35 million Views On Google And Google Maps! 35 Million Views On Our Tours. America’s Finest 360 just hit the 35 million view milestone. America's Finest 360 In Top 1% For October 2018. Each month America’s Finest 360 contributes Google Virtual Tours, reviews and still photos to Google and Google Maps. 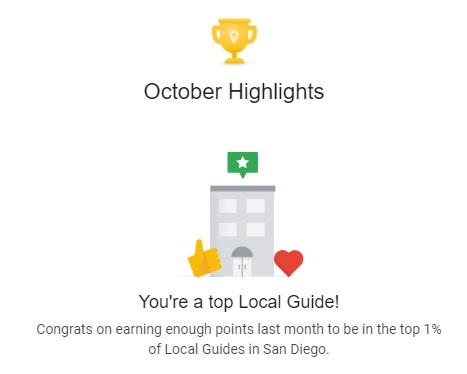 We work hard to be and stay at the top in our city of San Diego. As we are fortunate and grateful to work in America’s Finest City we enjoy what we do for local businesses to be showcased on Google and Google Maps and create more attention for local businesses. So, we would like to offer each business in San Diego county a special deal on a Google Virtual Tour. For a ONE TIME investment of only $347 (normally $547), we will come to your business and photograph up to a 10 panoramic image Google Virtual Tour for Google and Google Maps. This will be our November special. Contact us today. Keeping your Google Business Listing (GBL) up to date and current is vital to keeping it ranking high organically in Google search and Google Maps. We still see that some business listings are not even claimed. Claiming your GBL is easy by going to www.google.com/business. This site will walk you through the process of getting your business to show up in Google and Google Maps. Even if you provide a service and don’t have a physical location, you can still get a GBL without providing an address. Name, address and phone number (NAP) are critical to keep updated. This might sound obvious, but if your NAP is not updated or correct, your listing will not show up as often as prospects search for you. Google pulls from many search engines to get search results. Each site it pulls from needs to have the exact same information on it as your GBL does, right down to a comma or period. Did you know that you can post 30 second videos on your GBL? Well, you can and you should. You can talk about specials you are having, new products or services or anything relevant to your business. So start posting video because it also packs data into your GBL and Google loves data. Weekly posts can also be placed on your GBL. These posts can be the same as the 30 second videos but they do expire weekly so you need to post weekly. This is a good thing to post weekly because it shows Google that you are active on your GBL and Google likes activity. These are just a few things you can do with your GBL that are important to Google and they way they organically rank your listing on Google and Google Maps. So, get to work on this and you will begin to see a difference. Thanks for reading! Why Getting A Google Virtual Tour For Your Google Business Listing Is Important.